Model 88 offers an efficiency rating of 85.7 percent. The unit provides easier access for assembly and service with modular jacketing and tool-less jacket panels. 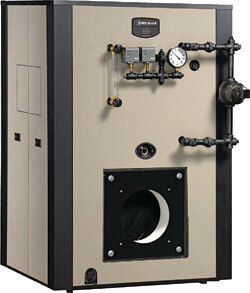 The boiler features: a hydro-wall design with water circulating completely around the combustion area, eliminating the need for a refractory combustion chamber or separate base; a built-in air eliminator and built-in horizontal flueway; and simplified piping, which reduces installation time.